Simon Spurr has clearly reached his tipping point. Anna Wintour and Ed Westwick sat front row at the designer's fall 2011 show, which was such a hot ticket there was a line snaking out the door just to get into the space. (When Thread NY bumped into Spurr later at the Ken party, he admitted it might be time to get a bigger space -- a good "problem" for any designer to have.) There were even a fair share of women's editors in attendance, curious to see what the tailoring master would come up with this season. Before the show Tommy Fazio, former men's fashion director for Bergdorf Goodman, and now President of Simon Spurr worked the room with an anxious enthusiasm. There was no need for nerves. The collection, which was predominantly black, white, and grey took its cues from Savile Row and consisted of one perfectly cut suit after the next. The black and cobalt blue striped suit was a standout. Hand knit cashmere hoods had the guys in the audience salivating. 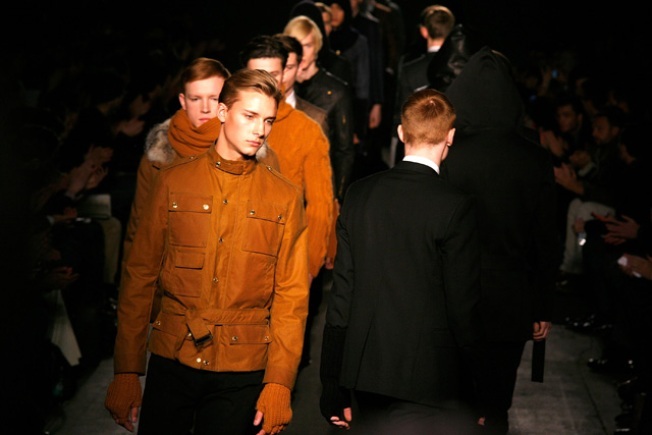 There was a slight rock and roll edge to the show thanks to a taupe shearling coat and a black motorcycle jacket. Consider this collection Spurr's graduation--expect an increased retail presence for the English designer in the coming year.